So creamy and refreshing! 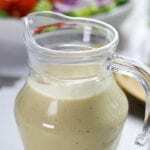 This Creamy Lemon Tahini Salad Dressing makes salads, roasted veggies, wraps, etc. completely irresistible. Whisk all ingredients together in a large mixing bowl until creamy and smooth. Store in an airtight container. **Stays fresh for 7-10 days when stored in an airtight container.